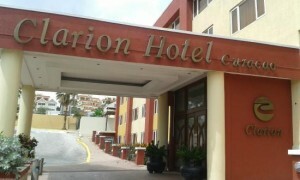 WILLEMSTAD - The Clarion Hotel in Piscadera is now called On Vacation. The hotel was recently called the Cala hotel but has now been taken over by the On Vacation group from Colombia. That group was recently interested in Kura Hulanda in Otrobanda and at Westpunt but that deal did not last. The Clarion hotel, next to the World Trade Center, had a low occupancy rate for some time.